Cats On My Quilts: Signs of Spring? 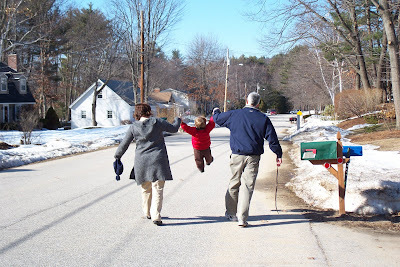 I've enjoyed everyone's spring pictures lately so we decided to see if we could find and signs of spring in our neighborhood yesterday with grandson, Carter, and his parents. Here's my home with the beautiful spring like scene in my front yard. See the yellow flowers? Oops, that's yellow snow-nevermind. I honor of Red Sox spring training Carter is chasing a baseball with his bat. 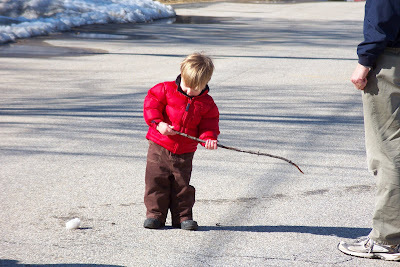 Wait a minute, that's a snowball and a stick. Oh well. But who cares what the winter has been like when you have peeps that care about you enough, like Momma and Ga, to give you a helping hand on the walk. I hope to stop whining soon about winter but the jury's still out on that promise. Oh I so can hear you!! You definitely have more snow than we do at this point. Quite a bit has melted over this weekend, but there is plenty still to be found. It is hard to believe the Red Sox will be playing soon. I am so looking forward to that, because that means spring is surely on its way. 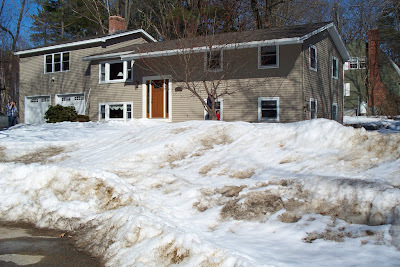 Have no fear your snow will melt soon! I live in Florida and can you believe it - we've already had the AC on! Spring is a favorite time of year for me too but unfortunately it lasts about 2 minutes! Hurry Spring! Snow isn't so pretty after it's been there awhile, huh? Carter is adorable. Such a DARLING pic of the two of you giving him a swing. I well remember my son constantly asking, "Swing me! Swing me!" until my shoulder nearly abandoned its socket.